My daughter and I visited Chandler, AZ earlier this month — our first trip to Arizona. It won’t be our last. We were instantly captivated by the desert landscape, friendly people and the lifestyle. With 330 days of sun and average daytime temperatures of 85*, it should come as no surprise that activities here focus on outdoor adventure! This family friendly city offers adventure and fun year round. Summer high temperatures average in the low 100s, so keep that in mind if you don’t like heat. Major League Baseball fans might want to schedule a trip to Chandler in March, during spring training. Fifteen MLB teams call Chandler “home” each March. Fans can enjoy “Cactus League” spring training games in smaller venues with low ticket prices and get a sneak peek at the season to come! Kick off your southwestern adventure with some wild, wild western fun at the Rawhide Western Town and Steakhouse. 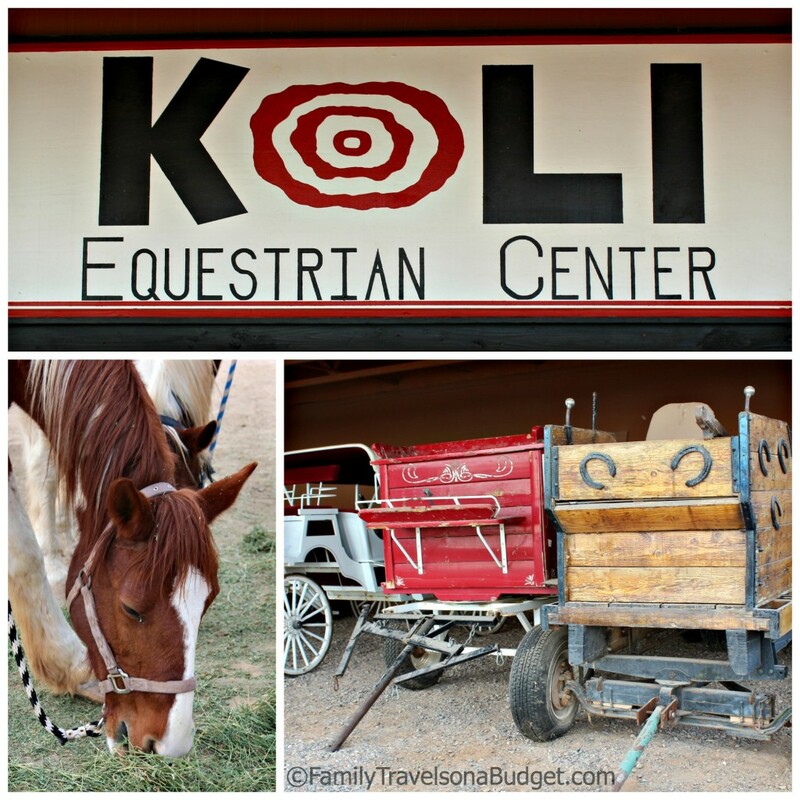 This attraction, which features an “authentic” 1880s western town including stagecoach rides, burro rides for kids, gold panning and wild west reenactments provides hours of entertainment for the whole family. Morning: Start the day with a stroll through Veteran’s Oasis Park, located at 4050 E. Chandler Heights Rd., Chandler, AZ 85249. Enjoy 4 ½ miles of trails, many paved and accessible. Venture along dirt paths to enjoy the arid landscape and to experience expansive views of the area. Dogs are permitted at the park, but must be leashed at all times. Veterans Oasis Park centers around a 5-acre fishing lake, stocked throughout the year. Daily fishing limits are posted at the lake and a fishing license, available online, is required. Covered picnic areas, butterfly and hummingbird habitats, a children’s playground and educational center, equestrian trails and a Solar System Walk round out the offerings at this park. Admission is free. Some events require a fee. Lunch: It’s the American Southwest, so enjoy a Mexican meal at Serrano’s. I strongly recommend the carne asada tacos, but you can’t go wrong no matter what you choose. Everything at this family owned restaurant is prepared onsite. One taste and you’ll be hooked! Afternoon: Beat the heat — especially if visiting during the summer — with a visit to Jumpstreet! This indoor trampoline park offers air-conditioned fun for the whole family. Whether you choose to bounce the afternoon away on the giant trampolines, give bull-riding a try, play trampoline dodgeball or jump into the enormous foam pits, everything at Jumpstreet! is sure to get your heart pumping. Parents, we recommend you laugh and play too (breaks are okay), but if you choose to watch — there is ample seating available. Admission fees, check this page. How to dress: No zippers, buttons or rivets — gym clothes are best. Free storage cubbies and paid lockers are available. 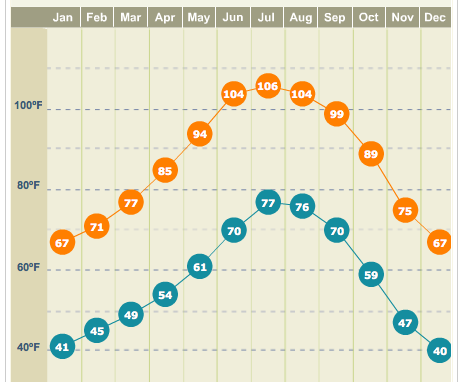 Of course, all that jumping means you’ll be hot, tired and thirsty. Stop at Paletas Betty, 96 W. Boston St., Suite 100, Chandler, AZ 85225 (Downtown Chandler) for a refreshing Mexican popsicle before returning to your hotel to freshen up. If you’ve never had a Mexican popsicle, be warned… they’ll ruin you for any other popsicle ever again. They’re that good! Evening: Evenings in Chandler are perfect for more outdoor adventure, catching a movie, shopping or just hanging out the pool. Skate with reckless abandon at Snedigars Sportsplex, offering free skating fun for skaters of all levels. Also here: picnic areas, children’s playground, and team sport fields. Give bowling a try at AMF McRay Plaza Lanes at 3825 W. Ray Rd., Chandler, AZ 85226. Shop till you drop at Chandler Fashion Center, the area’s premier mall. Relax in air-conditioned comfort at a local movie theater. 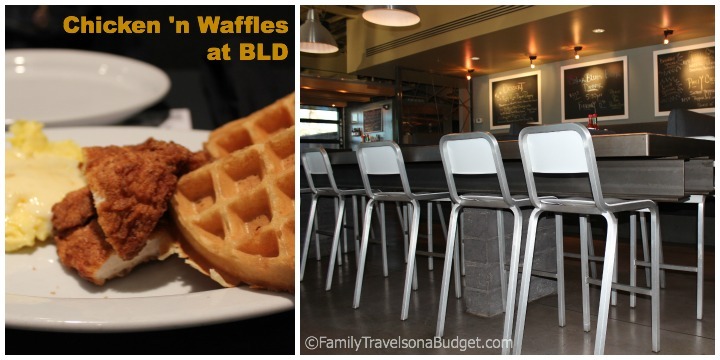 Lunch: Give BLD, located at 1920 W. Germann Rd, Chandler, AZ 85286, a try! The restaurant offers “upscale comfort food” in a loft-like space. Servers are knowledgeable and efficient — I tried stumping ours by asking boatloads of questions. She couldn’t be stumped! The food offers a twist on traditional favorites. We enjoyed a brunch menu of chicken and waffles, scrambled eggs and fresh fruit. I liked the chicken, seasoned in-house with just enough southwest heat, best. I still regret not ordering the butterscotch cheesecake for dessert, but that means I’ll have to go back! Afternoon: Summertime visitors might consider taking the kids to local Spray Pads, a fun way to beat the heat! Those visiting other times of the year, might enjoy one of the local playgrounds, particularly Tumbleweed Regional Park, especially Tumbleweed Ranch (offering a glimpse into Chandler’s past) and Playtopia! (a huge playground under a shade structure) or Desert Breeze Park which offers a Spray Pad, fishing lake, walking trails, playground, and volleyball court. Evening: See recommendations from Day One. Morning: Enjoy one of the parks you haven’t visited yet. Stroll the trails and capture photos of native plants and wildlife. Afternoon: Visit a local museum that fits your family’s interests. Arizona Railway Museum, dedicated to preserving southwestern railway history, this museum offers free admission to the yard. Explore train cars or the caboose for a small fee. Open weekends only, September to May. Chandler Museum tells the story of Dr. A. J. Chandler, a veterinarian who created the town in the early 1900s. Discover Chandler history from a distinctly local perspective. Opened in 2004, the Huhugam Heritage Center opened to the public to preserve and display tribal artifacts and art. The museum is open to the public and includes traveling art and history exhibits. The landscaping and architecture of the center is as much a part of its story as the artifacts it preserves. Evening: If you didn’t get a chance to visit Rawhide when you arrived, wrap up your vacation with a visit to this special attraction and restaurant! Go home filled with fun memories and great steak. 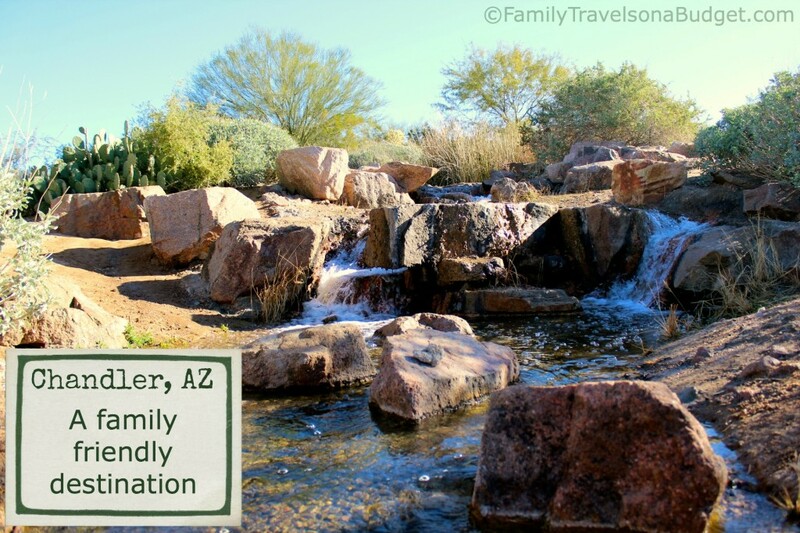 Whether looking for a true southwest experience, a fun outdoor destination or quality, inexpensive family time, Chandler, AZ makes a great family destination! This charming town has something for everyone and will not disappoint. To learn more about art, technology, Chandler’s historic downtown and other activities in the area, visit the Chandler Tourism website. My daughter, Ellie, and I enjoyed a trip to Chandler, AZ courtesy of the City of Chandler. We received free admission to a number of attractions included in this post, but all opinions expressed here are my own. I would love to visit Arizona and Chandler sounds like a great place. I would probably go any season but summer-as much as I am disliking the extreme cold here in NY this year-I don’t like extreme heat either. I would love to stroll around those parks and just relax. I have never been to Arizona but my brother was actually in Chandler this past fall. Looks like you have some great ideas here! Looks like a fun place to visit with the kids. My sister in law has been to Chandler and she loves it. It’s nice to read a little about it here!